For the month of March, we are offering Free Metro Delivery on all Kyocera Laser & Multifunction printers. eg, Medical, Legal, Mining, Construction, Tourism, Government and more. Call us on 1300 780810 and speak to one of our friendly customer service staff and check if you qualify for additional discount with our business promotional pricing. Adelaide Cartridge Centre supplies the full range of Kyocera Laser Printers, MultiFunction Centres, and MultiFunction Devices for those large organisations needing high volume printing & document management solutions. Kyocera Taskalfa MultiFunction Devices for large organisations are on a ‘POA – Price On Application‘ basis due to the large array of features and differing needs of users. eg, sorting, stapling, etc.Please call 1300 780 810 for enquiries. 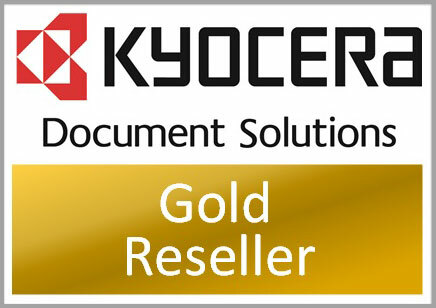 As a Kyocera Gold Reseller, we offer unbeatable deals on all Kyocera print hardware. We supply to all major capital cities & county areas from our distribution supply warehouses in all capital cities. To view our full Kyocera printer range, click on the Printers page, choose Kyocera printers and use the product filters to find a printer to suit your requirements.